Advanced Topics in Protected Intersection Design is a unique hands-on master class presented by the Dutch mobility experts at Mobycon in partnership with the Consulate General of the Netherlands in Chicago. This half-day master class utilizes local case studies and international best practice designs from the Netherlands to examine how various intersection types can protect all road users. 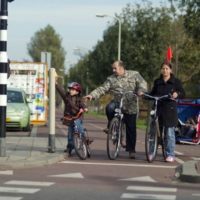 Learn the “Dutch approach” to single and bi-directional cycle tracks, signalized and un-signalized intersections and roundabouts. Next-generation intersection designs such as bicycle roundabouts, turbo roundabouts, and roundabout-intersection hybrids will also be covered. Join us in Chicago to learn cutting-edge intersection design strategies from Dutch mobility experts. Note that while this event is being held alongside the NACTO Designing Cities conference, it is not an official NACTO event. Please direct all inquiries to Mobycon.